I have no magic of my own to reward you with, so I'm asking for help from another faerie. Rainbow Fountain Faerie, come and bestow your blessing upon this Neopian! I cannot abide a debt that is not paid. The Maraquan Krawk looked down at his fins and tail. Even though it was sometimes inconvenient, because his siblings had traditional arms and legs, he loved being Maraquan. The feel of the water as he sliced through it, the gentle undulations of the waves nudging the flexible dorsal fins along his spine, the currents brushing his skin like a cool breeze...he couldn't imagine having to flounder about, pawing and kicking at the water in what the others called “swimming,” not being one with the element of his upbringing. Well, Baelia and Naia hadn't said that he himself had to be the one to bathe in the Rainbow Fountain. He was sure they would allow him to use the reward to grant one of his siblings a new colour instead. But which one? Whoever he chose, would the others be jealous? Would they be upset with him? And more importantly, did any of them even want to change their appearance? True, Muzoni himself believed that Maraquan was the best colour. But he understood that although it was the best colour for him, and to him, his siblings may have different beliefs. Maybe each one already felt the same way about their current colour as he did toward being Maraquan. Muzoni thought hard about each of his siblings. He had known them so long, and in all that time none of them had seemed to express much interest in being painted. Sure, when exciting new colours were released, there was a general buzz of excitement. One or two had discussed the Candy Krawk colour in particular for perhaps a longer period of time than usual, but the conversations gradually faded away and they had all gone on with their regular lives. But was that perhaps because of the cost? After all, 6 million Neopoints was not exactly pocket change. Or was it truly that as the news no longer became new, the expressed interest revealed itself to be general rather than genuine? All these thoughts ran through Muzoni's mind as he walked down the streets of Faerie City, away from the Faerie Quests office. Suddenly, a rumbling sound interrupted his thoughts, and made him chuckle. Patting his stomach, he silently agreed with it that lunch should be highest priority in his mind right now. I'll have mac and cheese! he decided. It had been a good and productive day, and he could celebrate with his favorite meal. The relatively light-hearted “problem” of what to do with his Fountain Faerie reward could be solved later. Finishing off the last bite, Muzoni gazed in satisfaction at his clean bowl. With his tummy full, his thoughts turned back to the problem at hand. Most people used a Fountain Faerie reward for an exclusive or expensive colour. This seemed to be the most worthwhile way to use it, unless there just happened to be a specific, less-expensive colour that one had been saving up for beforehand. But there were no exclusive Krawk colours. Muzoni's mind wandered. He licked his lips and got a last fleeting taste as his tongue encountered a bit of cheese that had been stuck on the edge of his mouth. If only there were a Mac and Cheese Krawk. Muzoni laughed out loud imagining what that would look like. Well, the day was young, he could do a little art project this afternoon for fun. Maybe the others would want to do some macaroni crafts as well, if they hadn't made plans yet. Muzoni hurried home excitedly. Nobody else had wanted to do crafts with him. True, it was a beautiful day outside, and it made sense to want to play outdoors, but now that he had the idea in his head, he wanted to start working on it right away. Should I start with plain macaroni and just paint it afterwards? he thought to himself. Usually macaroni crafts were made with uncooked macaroni. But uncooked macaroni was dry and hard. He wanted to make a sculpture-like object. If he used uncooked macaroni, he would have to mentally visualize each piece in a three-dimensional space, and then glue them one by one to each other. That seemed really difficult. Muzoni shook his head slightly. He decided to just make a regular pot of macaroni and cheese. Part of it could serve as a snack if he got hungry, and the rest would be his medium for the sculpture. That seemed to be the most efficient and delicious way to go about it. Yes, this would definitely be the best method. He set off for the kitchen to make some mac and cheese. An hour and a half later, Muzoni's tummy was full again, the kitchen table was a mess, and on a plate stood a tiny version of a Mac and Cheese Krawk. The cheese had dried into a sort of glue holding the whole thing together rather well. The only reason it was so small was because Muzoni had ended up being hungrier than he originally thought. No matter, it still got the point across and Muzoni was quite pleased with how it had turned out. Glancing at the clock, Muzoni decided he still had time today to go back to Faerieland. While he had been working on his project, he had had a crazy idea, and he wanted to ask Naia the Fountain Faerie something. Placing the plate with his macaroni and cheese sculpture on it carefully into a box, he quickly got ready to head out. When he arrived at the Rainbow Fountain, he started feeling a little nervous. He was sure nothing like this had ever been done before. He hoped he didn't come off as too audacious, or even disrespectful. Slowly he entered the purple pavilion where he knew he would find Naia. Naia swiftly came to his aid. “Is there something in that box you would like to show me?” she asked gently. Muzoni nodded, and quickly lifted the plate out of the box. On it, no worse for its travels, still stood the tiny Krawk sculpture made out of macaroni and cheese. “Yes!” Muzoni burst out. “You see, I love macaroni and cheese. It's my favorite food and I can eat it every day. And I thought, most people like to use their Fountain Faerie reward for an exclusive colour. The Chias have all the special fruit and vegetable colours, and Aishas can achieve an exotic Alien look, and of course there are the Poogles, but you know Krawks don't have an exclusive colour, and I thought well what if there were a Mac and Cheese colour, and only Krawks could be painted that colour, and what would it look like, and I thought I would make something so you could visualize it and if you liked it maybe you could use your powers and the magic in the waters of the Rainbow Fountain to create a brand new colour, as I know sometimes can be done, and you could make a Mac and Cheese Krawk and I would be so delighted, and of course for this favor I would give up my reward to bathe in the Rainbow Fountain myself.” Muzoni finished in a rush of words, and then held his breath for her response. Naia had listened with wide eyes as Muzoni had released a flood of words at her. But she had listened, and now that he was finished she sat quietly for a moment to collect her thoughts. Muzoni's face fell, as he understood that his request could not be granted. “I appreciate your enthusiasm, dear Krawkling, and your initiative. This truly is a lovely artistic piece, and very creative. I am sorry I cannot grant your other request, but of course I will still grant you one dip in the Rainbow Fountain when you have made a choice on an existing colour.” She hesitated a moment. “If you wouldn't mind, could I keep this little one?” she asked, placing one finger lightly on the nose of the tiny mac and cheese Krawk. Muzoni nodded silently, and turned to go. As he left, a shadow separated itself from one of the pillars of the pavilion. “Queen Fyora,” Naia said, bowing her head to the Faerie Queen. Naia nodded and swept her arm toward the sculpture in acquiescence. Fyora picked the plate up carefully and gazed at the little Krawk. It did seem remarkably life-like. She closed her eyes and concentrated, her lips pursed slightly. As the Faerie Queen opened her eyes, the little macaroni and cheese Krawk blinked his. He held his hands up to his face and gazed at them in consternation. Naia sucked in her breath, eyes wide. “Hello, little one,” Queen Fyora said to the Krawk. The tiny Mac and Cheese Krawk looked up at the huge face of the Faerie Queen and sketched a respectful bow. The Faerie Queen turned to Naia. “I think this little one better come with me to live in the Hidden Tower.” She set the plate down, now unneeded, and placed the miniature Mac and Cheese Krawk on her shoulder. Then without another word, she turned and left the pavilion, heading up to the castle. Naia continued to stare silently at the empty plate for a moment, and then quietly placed it back in the box, and set them to the side to be delivered back to Muzoni later. She wondered idly if anyone browsing the Hidden Tower would ever notice the Mac and Cheese Krawk, small as he was, while browsing the items available there. After all, you often don't see things that you're not looking for. Fashion is such a conundrum! Roo Island is full of fun, happiness and sunshine. The island exudes it! 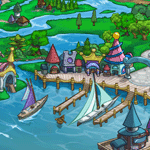 Roo Island is a small island located off the coast of Neopia Central. Once you step foot on the island, you are greeted with the smiling faces of bouncing Blumaroos! A guide to one of my favorite games in Neopia, Hasee Bounce.